I have a worksheet if saved as .xlsc, the button created using Form Control will not works. What button? Can you explain more? I created 3 buttons with macro. The original worksheet works after compile to .exe. But it will not work if I saved as .xlsc. Do you mean that the buttons do not execute macros or that the macros themselves do not work? Have you tried to replace one of your macros with a simple call to msgbox? When I click on the button that I saved with .xlsc file, no respond. The same click done in the original workbook (complied with XLSPadlock) no issues. It works in the .xlsc file with a msgbox. If the button with msgbox works, and it no longer works when you put your old code back in, it means that the problem appears in your code. To be able to help you, we need more information about that code. 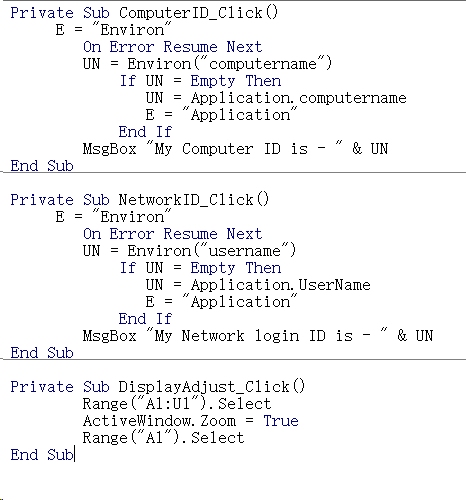 I have a workbook after converted into .exe using xlspadlock, I tried the following. Open the exe file and execute the macro (as per the screenshot shown above), I have no problem with it. If I open and save it under .xlsc file, the next time when I execute the workbook and select xlsc file, the macro will not work. basically there was not respond to the button when I click it. OK, but which actions does your macro perform? By the way, the buttons only work if I “zoom” in and out. - this only apply to xlsc file. Please send us your EXE file if possible.